Salesforce.com (s crm) CEO Marc Benioff, VMware (s vmw) CEO Paul Maritz and Amazon (s amzn) Web Services VP Andy Jassy shared the stage at Web 2.0 this afternoon to talk about “points of control” in cloud computing. The word of the day among the three was democratization: a fair word choice when discussing the underlying value proposition for cloud computing, but not necessarily when discussing their respective roles in it. Benioff, for his part, defined democratization as something that’s available to everybody. It’s inexpensive, efficient and doesn’t require buying anything. “I view cloud computing as something that’s not a private cloud,” he explained, calling out Oracle (s orcl) on its vision of massive integrated systems as cloud computing. Taking it a step further, Benioff described the cloud as “sacred” because it lets startups launch groundbreaking businesses – like Dropbox – without ever having to buy into the expensive, enterprise IT sales cycle. Maritz gave his take on the concept, as well, talking about portability: the ability to free applications from any specific set of hardware resources. With new programming languages, developers can write new classes of applications that can essentially run on whatever physical machine is available. Moving up the stack, to platform software, Maritz presented a nuanced definition of lock-in: “[I]t’s very different to say there’s a common place where everybody goes [versus] being tied or preordained to that space.” The statement was in reference to Amazon Web Services, but could very easily describe VMware, as well. The two also came down against any given piece of the software stack acting as a point of control. For example, Maritz explained, users shouldn’t be locked into choosing a cloud provider just because it has the data those users want. If, as he predicts, “our lives will be much more centered around information held in the cloud,” some companies could stand to get very rich by keeping tight control of data. Salesforce.com, for instance, makes its data available to Force.com developers, but no one else presently. 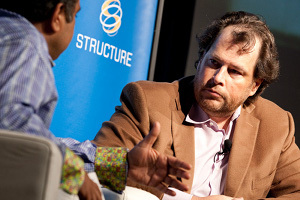 Benioff didn’t answer (and, in his defense, wasn’t asked) whether he plans to open up the Salesforce.com database. The irony, however, is that Salesforce.com and VMware are among the companies cited most often as forcing lock-in among their users. It’s convenient for Maritz to talk about application portability, because applications reside a layer above where VMware does business in a rather closed manner. In the case of Salesforce.com, Force.com developers don’t have to buy any hardware, but (until the VMforce integration is complete) they do have to buy into the proprietary Apex language, which means those applications aren’t going anywhere. Even Amazon’s Jassy, who reiterated time and time again the relative ease of getting started and leaving Amazon Web Services, neglected to note that AWS has been conspicuously absent from most cloud-standards discussions, and that data transfer between clouds is still no easy feat. Democratizing one aspect only to lock down another seems like a possibly hollow victory for customers. Maybe Benioff was right in his notion that all these concerns are just transient, and that they’re “post-traumatic stress disorder from Microsoft.” (s msft) After all, cloud computing is evolving in a hurry, and the myriad partnerships among parties (including VMware), as well as initiatives like OpenStack, truly are opening things up. Even Microsoft is pushing openness, to a degree, with Windows Azure and Hyper-V. It’s a new world, we don’t yet know what an open cloud will look like. Maybe choice and portability are all we’ll need.